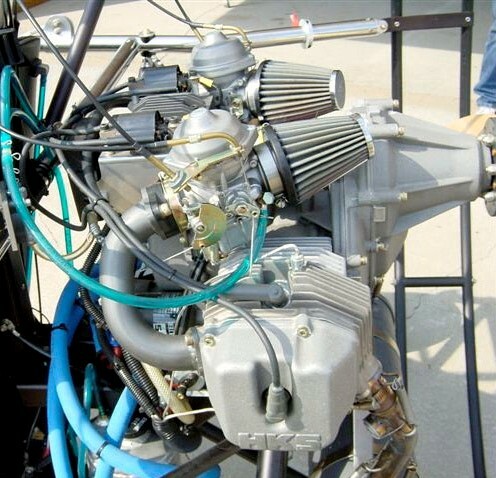 The HKS 700E is a twin-cylinder, horizontally opposed, four stroke, carburetted aircraft engine, designed for use on ultralight aircraft, powered parachutes and ultralight trikes. The engine is manufactured by HKS, a Japanese company noted for its automotive racing engines. 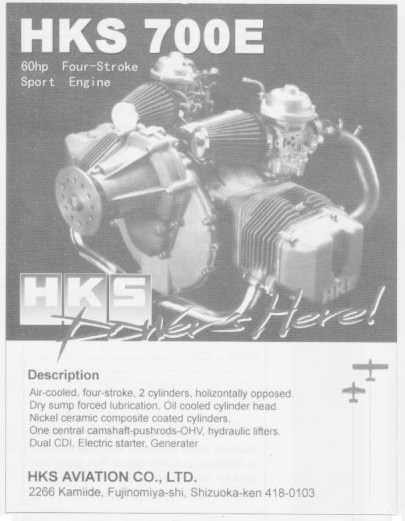 The HKS 700E has dual capacitor discharge ignition, dual carburetors and electric start. The engine is mainly air-cooled, but with oil-cooled cylinder heads. The OHV pushrod engine has four valves per cylinder, and nickel-ceramic coated cylinder bores. 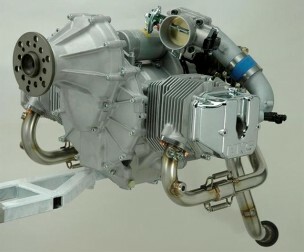 Lubrication is dry sump, with a trochoid pump. The reduction drive is a choice of two integral gearboxes: the A-type gearbox has a 2.58:1 ratio and can accommodate propellers of up to 4,000 kg/sq.cm inertial load; the B-type gearbox has a 3.47:1 ratio and can accommodate propellers of up to 6,000 kg/sq.cm. The 700E burns 9 L (2.4 US gal) per hour in cruise flight at 4,750 rpm. The recommended time between overhauls is 800 hours, although this is expected to be increased as experience is gained. 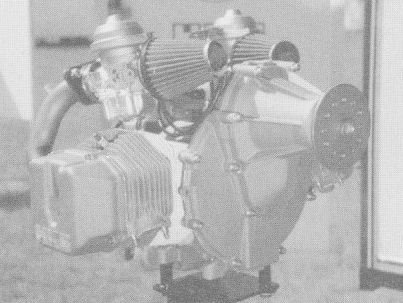 Producing 60 hp (45 kW) at 6,200 rpm for three minutes for take-off and 56 hp (42 kW) at 5,800 rpm continuously, the 700E was designed as a fuel efficient four stroke alternative to the high fuel consumption two stroke engines, such as the Rotax 582. WARNING! This is a non-certified aircraft engine, the possibility of engine failure exists at all times. Do not operate this engine over densely populated areas. Do not operate this engine over terrain where a safe, power off landing cannot be performed. The operating and maintenance instructions supplied with this engine must be followed at all times. Flying any aircraft involves the risk of injury or death, building and maintaining your own aircraft requires great personal responsibility. Initial version, normally aspirated and producing 60 hp (45 kW) at 6200 rpm for three minutes for take-off and 56 hp (42 kW) at 5800 rpm continuously. Turbocharged version with a 62.5 mm (2.5 in) stroke and a compression ratio of 8.8:1, that produces 80 hp (60 kW) at 5300 rpm for three minutes for take-off and 77 hp (57 kW) at 4900 rpm continuously. The engine's dry weight is 57.5 kg (127 lb) equipped with electrical system, electric starter, fuel injectors, gearbox, exhaust system and turbocharger. The initial time between overhauls is recommended as 500 hours, but this is expected to rise with operational experience.